Southern Spit Roast & BBQ Catering offers you a number of catering options, and tailor-made menus to suit all sorts of requirements. You can choose from the traditional spit roast menu, BBQ's, finger-food buffets, seasonal menus and delicious desserts. We also provide a delivery service and offer discounted menus for those on a lesser budget such as the express option. Whether you are looking for onsite catering, offsite catering or delivered catering, Southern Spit Roast & BBQ Catering provide professional catering services which will make your function, party or wedding a long lasting pleasant memory for you and your guests! We can cater for a small private party at a residential premises, your lavish wedding reception or a large corporate event.. plus everything in-between! In addition to the best exported quality meat, we also provide a range of appetisers, desserts, and extras. All the food is hand-prepared in our 'A-Grade Food Premises' using only the freshest ingredients. 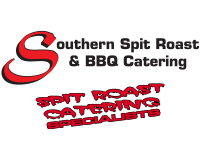 Southern Spit Roast & BBQ Catering are spit roast catering specialists and you will be amazed at how easy we are to deal with. Our spit roast meats have the bone in and our salads are made fresh by our chefs, in our A Grade kitchen so you know you are getting the best. "Our team are professional spit roast specialists and we give you our guarantee that you will be impressed with our very high standard of quality, quantity and helpfulness." We welcome your enquiries and would love to see you at our premises for an introduction to discuss all your spit roast catering needs!